Eschew the tourist crowds and head to Dolphin & Whale Watching and Scuba & Snorkeling. Visit Trial Bay Gaol and St Thomas Anglican Church for their historical value. There's still lots to do: enjoy the sea views from Tacking Point Lighthouse, admire nature's wide array of creatures at Billabong Zoo: Koala & Wildlife Park, explore the striking landscape of Sea Acres Rainforest Centre Port Macquarie, and make a trip to Breakwall Waking Path. To see ratings, where to stay, reviews, and more tourist information, go to the Port Macquarie trip maker . Sydney to Port Macquarie is an approximately 3.5-hour flight. You can also drive; or do a combination of flight and bus. While traveling from Sydney, expect slightly colder days and about the same nights in Port Macquarie, ranging from highs of 25°C to lows of 22°C. Wrap up your sightseeing on the 13th (Wed) to allow time to drive to Newcastle. Popular historic sites such as Watt Street Wharf and Shepherds Hill Fort are in your itinerary. Escape the urban bustle at Dolphin & Whale Watching and Tomaree Head. Explore Newcastle's surroundings by going to Hawks Nest (Bennetts Beach & Jimmy's Beach). There's much more to do: identify plant and animal life at Blackbutt Reserve, admire all the interesting features of Fort Scratchley, and enjoy the sand and surf at Nobbys Beach. To see maps, reviews, ratings, and tourist information, read our Newcastle trip planner. Drive from Port Macquarie to Newcastle in 3 hours. Alternatively, you can take a bus; or do a combination of flight and train. 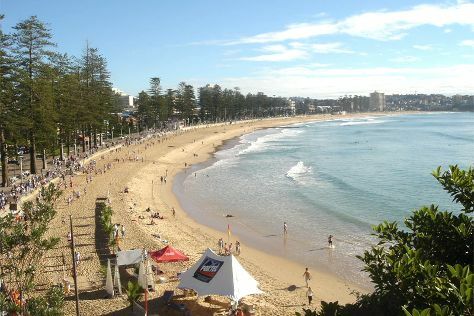 When traveling from Port Macquarie in February, plan for a bit warmer days in Newcastle, with highs around 32°C, while nights are about the same with lows around 20°C. Wrap up your sightseeing on the 16th (Sat) early enough to drive to Pokolbin. Start off your visit on the 17th (Sun): learn about winemaking at Scarborough Wine Co, meet the residents at Hunter Valley Zoo, do a tasting at Peterson House, then learn about winemaking at Audrey Wilkinson Vineyard, and finally look for gifts at Hunter Belle Cheese Room. For photos, reviews, traveler tips, and tourist information, read our Pokolbin trip app . Drive from Newcastle to Pokolbin in an hour. Alternatively, you can do a combination of train and taxi; or take a bus. Expect a daytime high around 32°C in February, and nighttime lows around 20°C. Finish your sightseeing early on the 17th (Sun) so you can travel to Windsor. Windsor is a town lying North-West of Sydney, New South Wales, Australia. Kick off your visit on the 18th (Mon): hike along Yarramundi Reseve, head outdoors with Trees Adventure Grose River Park, then take an in-depth tour of Hawkesbury Regional Museum, then admire all the interesting features of Anderson Farm Pick Your Own, and finally take in the architecture and atmosphere at Ebenezer Church. For ratings, reviews, and more tourist information, you can read our Windsor trip planner. Traveling by car from Pokolbin to Windsor takes 2.5 hours. In February in Windsor, expect temperatures between 33°C during the day and 20°C at night. Wrap up your sightseeing on the 18th (Mon) to allow time to travel to Sydney. Relax by the water at Manly Beach and Bondi Beach. Discover out-of-the-way places like Wentworth Falls and Shelly Beach. Take a break from Sydney with a short trip to Canyoning & Rappelling Tours in Katoomba, about 1h 40 min away. There's still lots to do: wander the streets of The Rocks, admire the natural beauty at Royal Botanic Garden Sydney, see a show at Sydney Opera House, and learn the secrets of beer at a beer tour and tasting. To find other places to visit, traveler tips, reviews, and other tourist information, go to the Sydney trip itinerary builder site . Getting from Windsor to Sydney by car takes about an hour. February in Sydney sees daily highs of 31°C and lows of 23°C at night. Finish your sightseeing early on the 22nd (Fri) to allow enough time to travel back home.